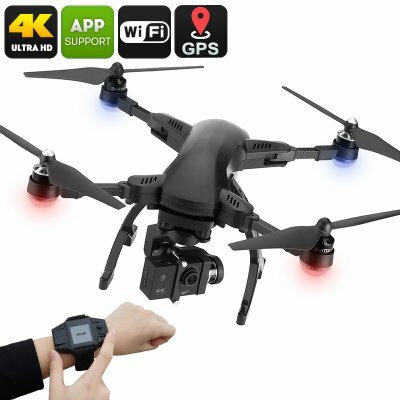 Successfully Added Drone Simtoo Dragonfly Pro - 4K Camera, Foldaway Arms, Follow Me, Point Of Interest, Panoramic Shot, Auto Hover, Takeoff / Land to your Shopping Cart. Exceptional portability quadcopter thanks to foldaway arms, comes with dedicated carry case. Easy to control drone with Follow Me, Point of Interest, Panoramic Shot, Auto Hover, Auto Takeoff / Land / Return. Innovative GPS control watch brings easier access to all the functions and keep your hands off the transmitter. 4K UHD aerial camera drone with 170-degree FOV, 3-axis gimbal for smooth wider shots in great resolution. The Simtoo Dragonfly pro drone is without a doubt one of the coolest looking camera drones around. This beginner friendly drone has an innovative folding design allowing it to fit easily in your backpack and thanks to the foldaway arms can pack down to 22.5x18.5x6.5 cm. It weighs a mere 1.25kg, including the battery, gimbal and camera and comes in a plush hard-shell case for easy transportation. The Simtoo Dragonfly pro drone has built-in GPS for intelligent flying functions and with a maximum speed of 20m/s, it can keep pace with all your outdoor activities. It comes with a comprehensive user manual although it's hardly needed as this sleek quadcopter is a sintch to put together and everything just clips into place or screws on with ease. The fact it can be quickly assembled/disassembled and folded up for easy storage and carrying in its dedicated case means you'll never have any reason not to take it with you everywhere you go. A real testament to the clever and intuitive design that makes this drone a real pleasure to use and means you'll be getting great usage from it. With its 3 axis gimbal and 4K camera featuring Sony imaging sensor, this quad copter will record stunning footage and snap amazing aerial photos. Thanks to the mobile app you can even sync the 4K action camera to your phone for FPV which lets you line up shots effortlessly. Whether you're a veteran of the air or just getting started the Simtoo Dragonfly pro is a worthy purchase. It's inviting controller lets you mount your smartphone for FPV and a small screen shows all the crucial information. Flying the drone couldn't be easier as the controller is very responsive and has a range of up to 1000m. The intelligent flight modes mean you can hover the drone in place, command it to follow you or orbit around your location. There is an auto home and land function and even controls for the gimbal so you can get perfect shots while the drone takes care of the flying. The Simtoo Dragonfly pro drone comes with 12 months warranty, brought to you by the leader in electronic devices as well as wholesale quadcopters and camera drones..